→ What Are the Best Chainsaw Chaps To Keep You Safe? What Are the Best Chainsaw Chaps To Keep You Safe? If you are going to operate a chainsaw, you need to practice extreme caution. After all, we might have heard horrendous stories about people being severely injured due to user error or issues with the chainsaw itself. Aside from wearing hearing protection and tough gloves, you would also need some form of protection for your lower body. No matter how tough you think your pants and your buddies are, you have to get the best chainsaw chaps before laying your hands on the cutting tool. So, why are chainsaw chaps specifically called that way instead of just pants? First of all, this safety clothing is specifically intended to protect chainsaw users from getting their legs, among other body parts, injured. The average jeans won't do any good in protecting your skin from incredibly sharp chain teeth moving at a rapid speed. Unlike ordinary pants, chainsaw chaps are created using cut-resistant materials. Even when a running chainsaw chain suddenly lands on your lower body, the chainsaw chaps will either stop it from operating or at least get the garment slashed instead of your precious legs. Still, it has to be clarified that chainsaw chaps are not a surefire guarantee to protect your lower body from a running chain. Most of the time, this protective clothing will give you an ample amount of time to either stop the chainsaw from running or move it away from you. Having a good chainsaw chap can mean life or death. You won't have to say hello with the reaper. On a lighter note, this will also keep your legs from being scraped if you accidentally trip or fall. Even if you are an expert chainsaw user, you can never guarantee that there will be no accidents whatsoever. Buying chaps will cost you a bit. But it will definitely be cheaper if, and if, you suffer a chainsaw-related injury and pay hospital and medical bills. If you are a beginner, this clothing will ease you into using a great, powerful yet risky tool. For people who do not want to wear such safety garments, they should hire a professional to operate a chainsaw. Before purchasing a couple of chainsaw chaps for yourself, first let's take note of several factors. The market is abundant with these safety garments. Some are manufactured by famous companies while others are from small businesses. Regardless of their price and their brand, here are some of the things you should be on the lookout for. 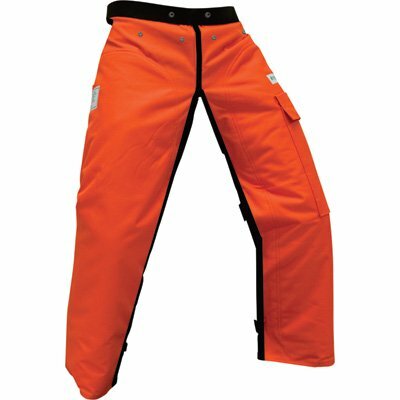 While it is not cut-proof as you might have wanted, chainsaw chaps are still the best option in keeping your lower body safe from immediate and severe harm during cutting operations. In choosing the right pair of chaps, you have to check both the outer and inner section. The external layer of the most effective chainsaw chaps is typically slippery with the material being tightly woven together. Why make it slippery? Well, in case the chainsaw chain does attempt to dig into your legs, the slippery surface will make it difficult for the teeth to get stuck in your pants and reach your skin. During those few seconds of the chainsaw teeth slipping due to the chaps, you'll have the opportunity to escape from harm's way. Likewise, the inner section of chainsaw chaps features ballistic fibers. This is the primary safety feature of the garment as these fibers are made of Kevlar material. Just like the outer material, the ballistic fibers are tightly woven together. However, this doesn't work like the slippery material as this does not merely deflect the teeth away. Instead, the ballistic fibers in the inner layer of the chainsaw chaps protect you by allowing themselves to be quickly torn and shredded apart. Once the chainsaw teeth sink into them, the fibers are flung in many directions. Before you can even observe what is happening, some of these ballistic fibers will enter and jam the chainsaw up. This is the last line of defense of the garment, and it does a fine job at it. Aside from protecting you, the chainsaw chaps shouldn't hinder you from comfortably operating the chainsaw. As we all know, you would have to constantly move around to find the best angle to cut a tree. Some chainsaw chaps, particularly those made with hard polyester, are so thick and restricting that you won't be able to do your job in the first place. Worse, you put yourself at risk of accidents if you operate a chainsaw when you cannot move properly. In other words, there needs to be a balance between user safety and flexibility. A lot of chainsaw chaps are manufactured to be quickly adjustable. Still, you should not buy a pair that's meant to accommodate all sizes. Ideally, you need chainsaw chaps that fit you well. You cannot have a pair that won't cover the body parts that are most prone to getting hit by the chain. The chainsaw chaps you buy should have straps and buckles that will allow you to get the best fit possible. On a related note, it should be easy to take off whenever you want to. You are already wearing pants underneath the chainsaw chaps, so it can be warm quickly especially during hot summer days. It's important that you can remove it quickly during your breaks. Another thing affecting your comfort with the chainsaw chaps is the weight. A heavy pair of this garment will mean the exertion of a bit more pressure than usual to move around. Do not choose chaps that are bulky as these will accelerate your fatigue during cutting operations. There are variants out there that are light yet strong enough to keep you safe. Lastly, you have to get chainsaw chaps that comply with the requirements set by relevant organizations and associations. These entities create rules and tests to ensure that each product is safe enough to be acquired and used by any individual. When looking for chainsaw chaps to buy, look for those with certifications from the Occupational Safety and Health Administration (OSHA), Underwriters Laboratories (UL), or the American Society for Testing and Materials (ASTM), among other reputable groups. Black & Decker MM2000 13-Amp Corded Mower, 20"
The first product we have for review is the Forester Chainsaw Safety Chaps. While it isn't meant to be used with electric-type chainsaws due to their high torque characteristic, this garment is designed to work well with gas-powered variants. Forester clearly aimed to build consumer trust, so they got sufficient safety certifications for these chainsaw safety chaps. 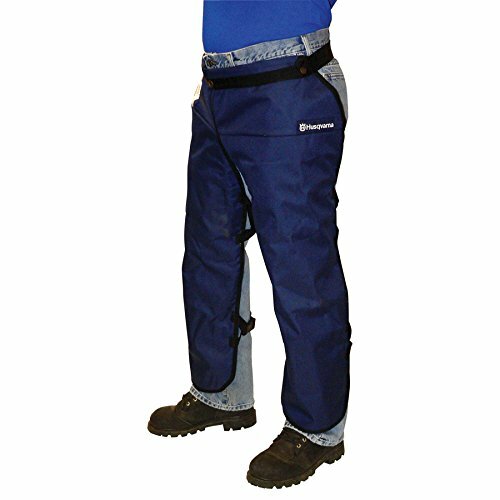 For one, the Forester Chainsaw Safety Chaps comply with the requirements indicated in ASTM F1897-14, which is also known as the Standard Specification for Leg Protection for Chain Saw Users. Thus, the ASTM confirms that these chainsaw chaps do not only provide cut resistance protection around the leg area but also provide a good fit and flexibility. Likewise, the garment meets the requirements set by the OSHA 1910.266 and also has a certification from UL. To protect the front of the user's legs - the most likely area for chainsaw-related injuries, the Forester Chainsaw Safety Chaps with Pocket work like an apron. The external material is composed of Oxford fabric, which not only effectively resists oil coming out of a chainsaw but also repels water. The inner section features 12 distinct layers of protection to deal with a rotating saw before it reaches the human skin. A nifty feature from this Forester Chainsaw Safety Caps is the pocket, which is six inches by six inches large. This pocket is deep enough to keep some handy tools and accessories in our chaps for quick access. Furthermore, there are three sizes available. If your height is from 5 feet to 5 feet and 4 inches, the short length would be the right fit for you. If you exceed 5 feet and 4 inches without going beyond six feet, the regular length would be best. Lastly, those who are at least six feet tall and reach up to six feet and four inches should choose the long length. Notably, all three length sizes can accommodate waist sizes ranging from 28 inches to 44 inches. To adjust the fit around the waist area, the Forester Chainsaw Safety Chaps come with a two-inch flip waist belt. Regardless of the size, we found these Forester garments to be both sturdy and light. We did not feel restricted at all when wearing them during some tree felling operations. Durable with Oxford outer and a 12-layer inner section. Complies with OSHA 1910.266, ASTM F1897-14, and UL requirements. Pocket is deep enough for carrying handy tools. Flip waist belt is included for getting the right fit. The waist belt can become loose from time to time. Cannot be used with electric-type chainsaws. Up next, we have chainsaw chaps that are also styled like an apron to adequately protect the front section of the legs. It complies with the aforementioned ASTM F1897, the OSHA Regulation 1910-266, and with the requirements of the Underwriters Laboratories. Apart from this, the Husqvarna 531309565 Chain Saw Apron Chaps meet the Z133.1 Safety Standard of the American National Standards Institute (ANSI), which is useful for arborists and workers in related fields. You can pick between three colors: blue, black, and gray. While the choices aren't exactly diverse or vibrant, they will likely complement your pants regardless of the color. Moreover, the Husqvarna 531309564 Chain Saw Apron Chaps has Tek Warp protective layers and 600-denier polyester fabric that is coated with polymerizing vinyl chloride (PVC). This particular type of polyester fabric is a favorite choice due to its water resistance and tolerance to heavy-duty exposure. Consequently, the Husqvarna 531309565 chainsaw chaps have a tool pocket and a wear-resistant and low-friction Acetal Delrin buckle. The waist size, on the other hand, could be adjusted to as big as 38 inches. Front area of the lower body is safeguarded due to the apron style. Backside is quite cool to compensate for the near total coverage at the front. The snaps used to adjust the chainsaw chaps are made of plastic. Mobility around the knee area is somewhat affected. 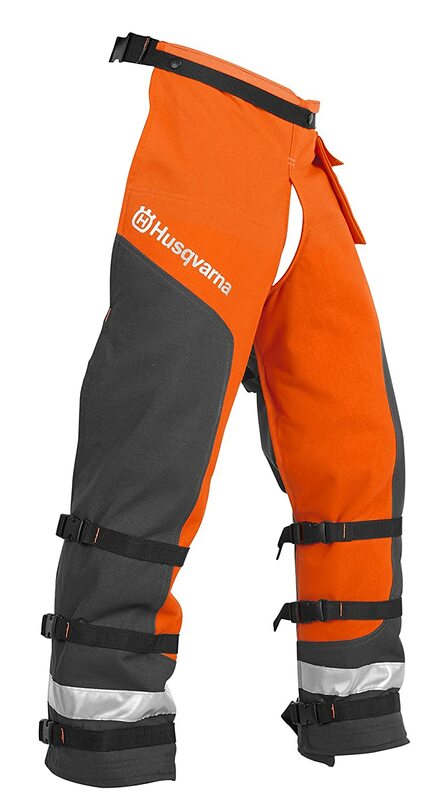 Finally, we have another pair of apron-style chainsaw chaps in the form of the Husqvarna 587160704. While the previous Husqvarna product utilized a 600-denier polyester, this one uses a 1000-denier polyester fabric along with PVC coating. Apart from being able to withstand heavy-duty use and being water repellant, the 1000-denier polyester fabric is also incredibly hard to tear and resistant to abrasions. Similar to the previous Husqvarna garment, this also has five layers of Tek Warp material, a gear pocket, and buckles made of Acetal Delrin. With the Tek Warp material, the chain can be either slowed down or completely stopped by clogging the chainsaw's sprocket system. Still, the ability to clog the chainsaw will be dependent on various factors such as the chain length and the chain speed. One slight difference we noticed is that the waist size here can be adjusted up to 42 inches. Of course, the Husqvarna 587160704 Technical Apron Wrap Chap is certified to have complied with the UL, the ASTM F1897, the ANSI Z133.1, and the OSHA Regulation 1910-266 safety standards. Complies with various safety standards. Utilizes a 1000-denier polyester fabric for added toughness. Has buckles made of wear-resistant Acetal Delrin. Waist size is adjustable up to 42 inches. Feels bulky especially around the lower section. The pocket buttons tend to become unbuttoned when you are moving. In the end, our favorite pair of chainsaw chaps is definitely the guy from Forester. While all of them have an apron-style design, a handy pocket, and certifications from various organizations such as OSHA, UL, and ASTM, we think that the Forester Chainsaw Safety Chaps have the overall advantage. Even if it cannot be used for electric chainsaws, these chainsaw chaps are a fantastic choice for gas-type chainsaws. First of all, this is the only pair of chainsaw chaps that have 12 layers of protection. Secondly, the outer section of the Forester Chainsaw Safety Chaps is made up of oil-resistant and water repellant Oxford fabric. Likewise, it's comfortable to wear since our movement isn't restricted. There's even a waist belt to ensure that we have the right fit during each sawing operation. Thus, the Forester Chainsaw Safety Chaps are our favorite because the garment has all three factors we are looking for: quality materials, fit and comfort, and certifications. We hope that our guide on picking the right chainsaw chaps helped you in making an informed decision. If you have any queries, do give us a comment.